that there are many, many people out there that get the "feel" of an event through your work . . . It enriches all of us, as you have just the proper balance between nature and people and sport that paints a very complete picture, an aesthetic quality not easily obtained . . . May you long continue, for it nourishes your fans everywhere. You can sure count me as one. Your friend, Pete Stringer"
Pete is generous in his praise and very diplomatic about how "comprehensive" some of my journal entries are! What can I say? I love to write and brevity has never been one of my strong suits. I figure those who have the time will wade through the topics that interest them. Those with less time or interest can skim the sub-headings or just enjoy the photos. This year we decided to have some winter adventures, not just summer ones! So I have a good excuse to begin the 2008 journal earlier than usual. This is my fourth journal chronicling Jim's and my ultra running and traveling adventures and occasional inadvertent misadventures. The 2005 journal covered our Appalachian Trail thru-run/hike. 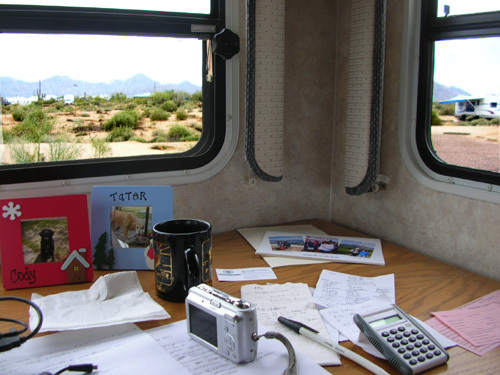 It was so much fun to write and the feedback was so gratifying that I just kept on writing and taking photos on our summer Rocky Mountain running trips in 2006 and 2007. Last summer we decided to add in a second trip spanning the end of 2007 and the beginning of 2008. Our plans morphed several times, but always included running our first serious attempt at a 24-hour event, the Across the Years (ATY) 24-, 48-, and 72-Hour Run. We'd considered it previously, but Phoenix is a long drive from both Billings, Montana, where we lived in the early 2000s, and Roanoke, Virginia, our residence the last four years. We finally realized that the freedom to go anywhere we want, any time we want is why we retired early, so let's go! That's how we find ourselves in Arizona in January. I can't believe two weeks have slipped by so quickly since we ran Across the Years. All the information about that race is in the 2007 journal. We thoroughly enjoyed the time we spent with friends at Nardini Manor. The race was a satisfying finale for me to a good year of running. Although Jim isn't as pleased with his races in 2007, he's optimistic about 2008. So am I. It's going to be a great year! My first entries in this new journal will chronicle what we've been doing in Arizona since ATY and whatever adventures we have on the way back home. 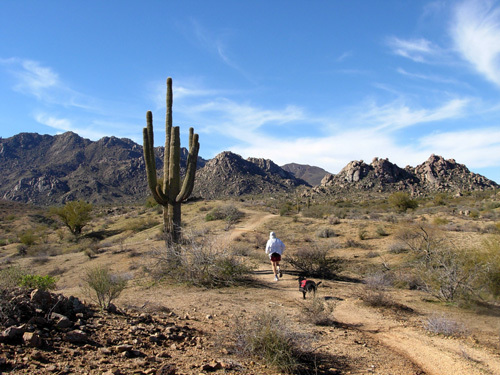 It will include scenic stops in New Mexico and another interesting ultra in Texas in a couple of weeks. Jim has several ultras scheduled this winter and spring to prepare him for the Bighorn 100-miler in June. He hasn't given up on that one yet and I'm excited about going back to the Bighorn Mountains. We'll probably work an aid station again at Hardrock and help out at Leadville, too. Or maybe we'll go somewhere else after the Bighorn race . . . or come up with something totally different this year! One thing we're very good at is being flexible with our plans. Since I sometimes upload journal entries late, our relatives have to call or e-mail us to find out where in the world we are. Retirement's fun like that! We highly recommend it. On the frame at left are links to the companies that have previously sponsored us and continue to give us discounts on their products. I can't tell you how many dozens of pairs of Montrail shoes we've worn in the last ten or twelve years or the copious amounts of our favorite nutritional items we've consumed from Hammer Nutrition. We asked for discounts before the AT trek because the products worked well for us. We still use them (and would even if we weren't getting a discount) and we continue to recommend that others give them a try. Even though we aren't elite ultra runners we try to be good ambassadors for our favorite sport and these companies value that. They also appreciate the exposure they receive on this web site. We are grateful for their continuing support. This is our fourth annual running-related web journal. There are links to each year in the frame at left, which you should see from every page of every journal, as well as on the home page. The links take you to each year's topics page. Scroll down to see the various topics. When you're done with an entry you can go forwards, backwards, or return to the topics page. For additional photos click on the link for more photos. That takes you to our Picasa photo-sharing site. There are albums covering various races since 2004 and a "virtual tour" of the entire Appalachian Trail. I may eventually do a "tour" of the whole Colorado Trail, but meanwhile many of those photos are already in the 2006 and 2007 journals. Jim has links to some other running sites we like on the home page. We love receiving feedback from readers. Use the contact us link in the frame to the left if you have a question or comment. I'm still getting questions about the Appalachian Trail (AT) and hope hikers and runners continue to find the information in that journal to be useful for years to come. One of my original goals for writing the AT journal was to inspire other people to set big or meaningful goals in their lives and go after them with all their heart. That's still one of the reasons I enjoy writing these journals -- to serve as a role model for being adventurous, regardless of age. We are all capable of so much more than we think we are even in our middle and senior years. Some of our "adventures" may be less physically strenuous than they were thirty years ago, but they are still "adventures" to us. Jim and I are two athletes nearing sixty years old who refuse to sit around and die a premature death because of inactivity, poor nutritional habits, boredom, or fear of the unknown. We like to push our personal mental and physical envelopes because that's just how we're wired. Although we see ourselves and our ultra running friends as "normal" we have continual feedback in our daily lives that we are NOT the norm in our present society. We hope to be examples of what men and women in their fifties, sixties, and beyond can accomplish when they care enough about themselves to pursue their dreams and seek long, healthy, productive, interesting lives. I have a recommendation for a good book for our readers who are middle-aged or older. Heck, you can learn a lot from it even if you're in your 30s or 40s. It's especially appropriate at this time of year when many folks are motivated to change their lives, or are simply unmotivated to get outside and exercise in crummy winter weather. It's called Younger Next Year, written by Chris Crowley and Henry Lodge, MD. There are both men's and women's versions. You can get the paperbacks for only about $10 each from Amazon or find them free at your local library. I'll talk more about the book in another entry. Meanwhile, start reading it and you'll be champing at the bit to make some healthy changes in 2008. It's gonna be a great year! Come along on our new journeys and have some fun with us. Next entry: Where the heck are Sue and Jim?? Our 2008 running and travel plans.